Twilight Princess is the first game in The Legend of Zelda series to be rated T by the ESRB for fantasy violence and animated blood. The story focuses on the hero Link trying to prevent Hyrule from being engulfed by a corrupted parallel dimension, the Twilight Realm. To do this, he takes the forms of both a human and a wolf and has the help of a mysterious creature named Midna. The game takes place hundreds of years after Ocarina of Time and Majora's Mask. 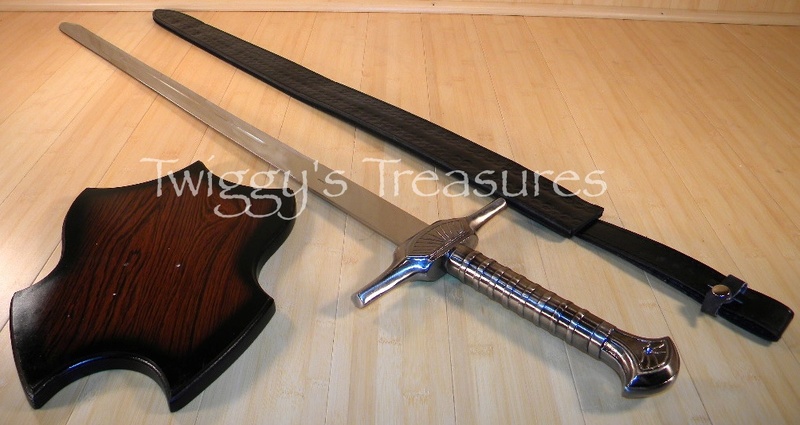 This sword is a replica of the one featured in the video game Legend of Zelda Twilight Princess. The piece features an all metal handle with a unique design. Sword comes with its own display plaque and black leather sheath. ▪ Overall Length: 44 3/8"